Ross County keeper Mark Brown produced a superb second-half performance to deny former club Inverness Caledonian Thistle in the Highland derby. Yoann Arquin put the visitors ahead to boost new manager Jim McIntyre and his Scottish Premiership strugglers. But Caley Thistle responded after the break when Marley Watkins side-footed a deflected cross home from 10 yards. County had to defend to protect a point, with Brown making impressive saves from Aaron Doran and Watkins. The point lifts John Hughes' Inverness side into third in the table on 17 points, three behind leaders Hamilton, while the Staggies remain rooted to the foot of the league but within touching distance of Motherwell and St Mirren. County had been pressing the home side in the lead-up to the goal but it was Inverness who had started more brightly, testing County keeper Brown in the first minute, when Billy McKay jinked past his marker and fired in a low shot, but it was easily saved. Then Graham Carey cracked a free-kick over Brill's bar in the 12th minute as County went close. County should have scored five minutes later when Filip Kiss nipped in to take advantage of Draper's short back pass, but he could only stab the ball into the body of keeper Dean Brill. The home defence was finally exposed, though, in the 21st minute when Quinn lobbed the ball into the box from the left side and Arquin picked his spot before calmly heading home from the six-yard line. Quinn should have made it two in the 32nd minute but his shot from six yards was straight at Brill who blocked with his feet and who then pulled of another save from an Arquin drive only seconds later. Inverness had their best chance of the half five minutes from the break when Ryan Christie lunged at a Greg Tansey cross from the right which county keeper Brown touched over the bar. Carey hit a terrific free-kick just as half time approached but Brill threw himself to the left to push the ball to safety. Caley Thistle were level within five minutes of the restart, Watkins netting after Christie's cross deflected off Scott Boyd's head into his path to score. Doran then rifled a shot in from 20 yards but Brown dived left to hold them ball. County keeper Brown again came to the rescue in the 62nd minute, cutting out a low Watkins ball across goal. And Brown made another terrific stop just minutes later when Watkins seemed certain to score after a lung-bursting run and pass from Doran set him up, but the keeper spread himself to make a superb stop. Billy McKay then raced through with Ben Frempah chasing and that attention forced the Inverness striker to push his shot wide of the goal. Brown saved County again with an instinctive save from a McKay point-blank shot and then threw himself at shots from Draper and Christie in succession to thwart the home side. The home side maintained the pressure right to the death but County defended desperately to ensure that the points and local bragging rights were shared. Match ends, Inverness CT 1, Ross County 1. Second Half ends, Inverness CT 1, Ross County 1. Attempt blocked. Marley Watkins (Inverness CT) right footed shot from the centre of the box is blocked. Foul by Darren Barr (Ross County). Attempt saved. Greg Tansey (Inverness CT) right footed shot from the centre of the box is saved in the top centre of the goal. Corner, Inverness CT. Conceded by Scott Boyd. Attempt missed. Jake Jervis (Ross County) header from the centre of the box is high and wide to the right. Attempt missed. Greg Tansey (Inverness CT) right footed shot from outside the box is too high. Attempt saved. Ryan Christie (Inverness CT) right footed shot from a difficult angle on the right is saved in the top right corner. Attempt saved. Ross Draper (Inverness CT) right footed shot from outside the box is saved in the top centre of the goal. Corner, Inverness CT. Conceded by Joe Cardle. Corner, Inverness CT. Conceded by Mark Brown. Attempt saved. Billy McKay (Inverness CT) header from the centre of the box is saved in the top right corner. Substitution, Ross County. Liam Boyce replaces Filip Kiss. Attempt saved. Ryan Christie (Inverness CT) left footed shot from the right side of the box is saved in the top centre of the goal. Attempt saved. Jackson Irvine (Ross County) header from the centre of the box is saved in the top centre of the goal. Billy McKay (Inverness CT) hits the left post with a right footed shot from the centre of the box. Attempt blocked. Filip Kiss (Ross County) right footed shot from outside the box is blocked. Hand ball by Graham Carey (Ross County). Attempt missed. Gary Warren (Inverness CT) header from the left side of the six yard box is close, but misses the top left corner following a corner. Substitution, Ross County. Darren Barr replaces Yoann Arquin. Attempt saved. 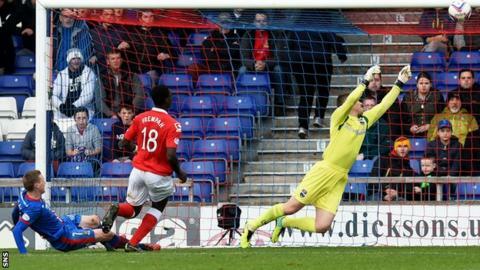 Marley Watkins (Inverness CT) right footed shot from the centre of the box is saved in the top right corner. Delay in match Dean Brill (Inverness CT) because of an injury. Ross Draper (Inverness CT) wins a free kick on the left wing. Attempt missed. Ross Draper (Inverness CT) header from the left side of the six yard box is close, but misses to the left following a corner. Corner, Inverness CT. Conceded by Richard Brittain. Attempt missed. Aaron Doran (Inverness CT) right footed shot from the left side of the box misses to the right. Attempt missed. Ryan Christie (Inverness CT) left footed shot from the centre of the box is close, but misses to the left following a set piece situation.